Audie Murphy Ranch is gearing up to welcome its newest family neighborhood. 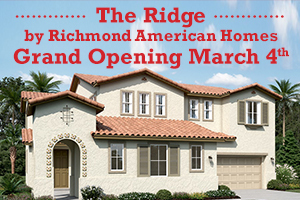 Don’t miss the festivities on Saturday, March 4th, when Richmond American Homes hosts the Model Grand Opening of The Ridge. Tour the beautifully decorated model homes and enjoy delicious fare from the Sprinkles Cupcake truck. The Ridge will debut spacious one- and two-story single-family homes with up to 7 bedrooms and five baths. Prices are anticipated from the low $400,000s. 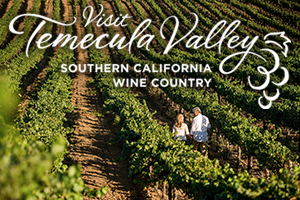 Temecula Valley Southern California Wine Country offers a range of exquisite cuisine to delight every taste. From fresh seafood and authentic Italian cuisine to Americana fare, now is a great time to discover the sumptuous variety of restaurants within Old Town Temecula for a special night out or casual lunch with friends. With its historic, quaint ambiance, there is no setting quite as charming Old Town Temecula.